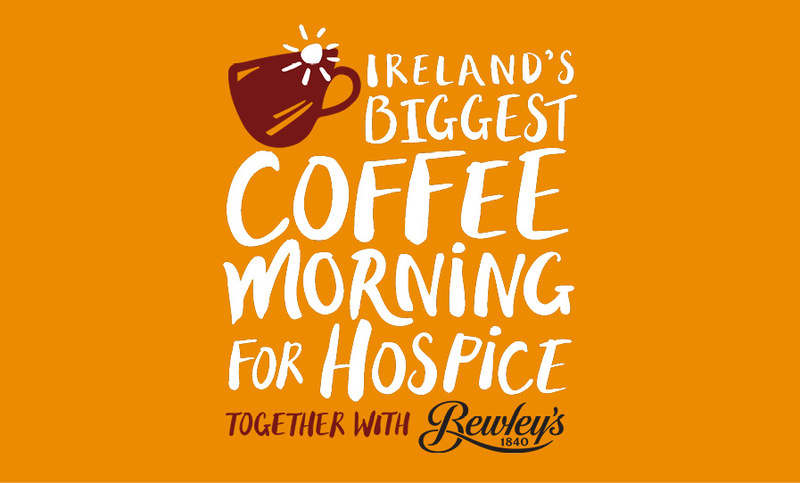 Ireland’s Biggest Coffee Morning for Hospice together with Bewley’s, is 24 years old. 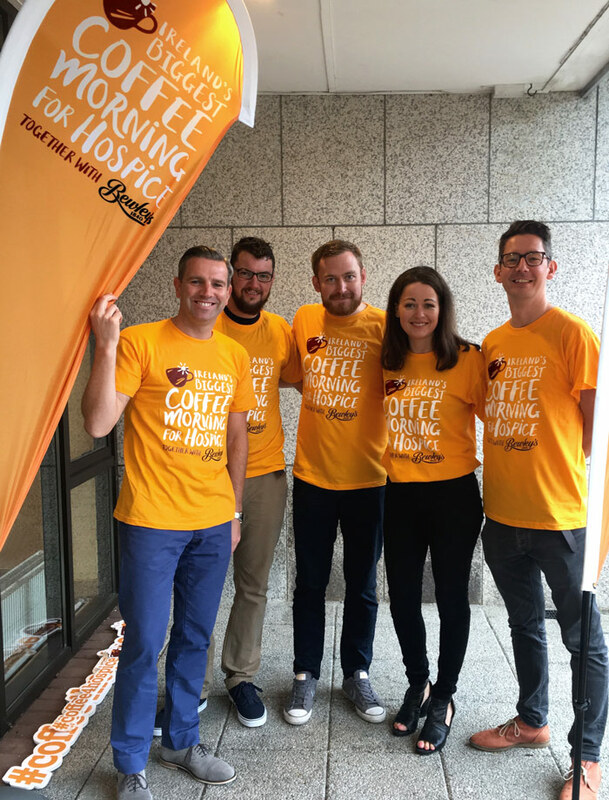 In over two decades, Ireland’s longest running one day charity event has raised over €32 million for hospice care nationwide and served over 16 million cups of coffee. However, the non profit landscape is changing. There are more charitable organisations in Ireland, with more fundraising initiatives to compete with, than ever before. Donations are down, consumers are skeptical and contributions to ensure the vital services of hospice groups to our communities, are being challenged. Hospice services remain in desperate need of funding and in many areas around Ireland, there is a real lack of available services. We all know people who have been supported, comforted and cared for by hospice services. Staff work tirelessly to help patients to live life as fully as possible with dignity and comfort whilst making the most of precious time with their family and friends. 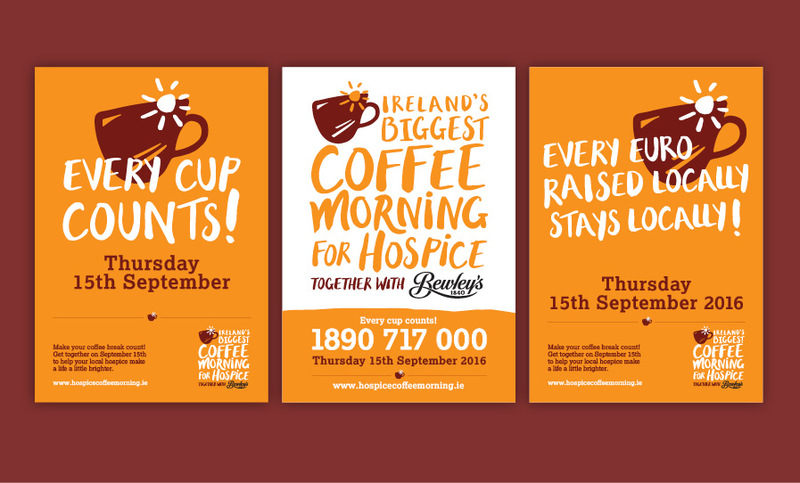 Realising first hand the critical nature of these services, we were delighted to come on board to transform Ireland’s Biggest Coffee Morning for Hospice supported by Bewley’s. We began with stakeholder workshops to get under the skin of what the event was all about. We conducted international benchmark reviews and positioning studies on all Irish same day charity events. As a team, we rewrote the campaign ambition, aligning everyone behind a huge, audacious goal. e created a campaign identity that brims with personality, its loose typographic style feels personal and everyday, rather than institutional, reflecting the deep personal nature of the services delivered. Our key visual is a coffee cup with the sun rising in the background and our optimistic orange colour palette reflects the comfort and care provided by the staff. We set about developing a messaging system elevating why this campaign is so important. 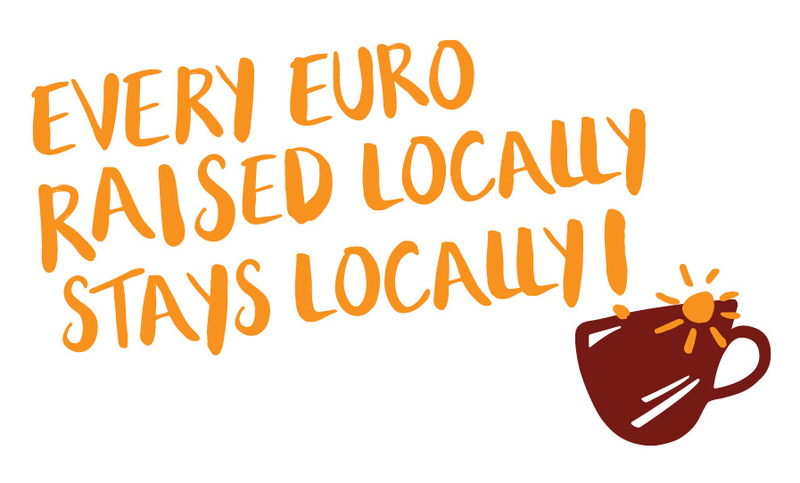 A core message being that all money raised locally, stays locally. So by supporting the campaign, you are supporting a vital resource for your local community. Our next requirement was passionate brand ambassadors, ambassadors that had experience with hospice, and that could speak fluently about the importance of supporting the campaign and the impact the monies raised made at local level. 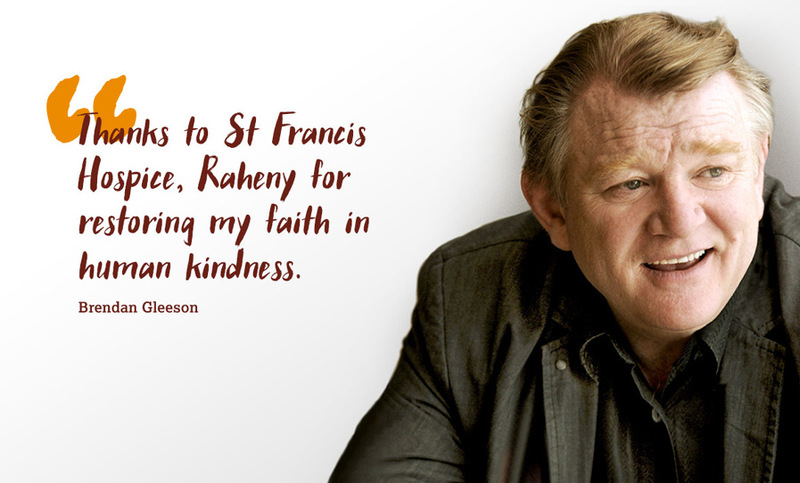 To date, Domhnall Gleeson, Brendan Gleeson, Imelda May, Gabriel Byrne, Mario Rosenstock and a host of other high profile advocates have readily come on board to support and promote the day. 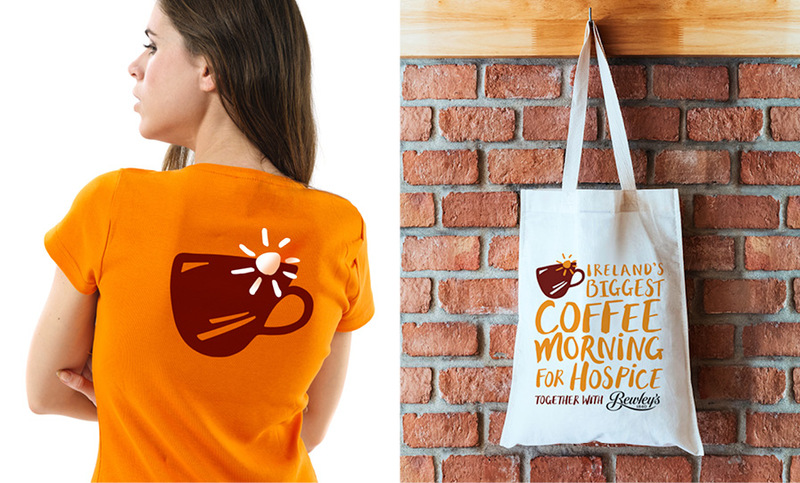 The campaign launches this week and Ireland’s Biggest Coffee Morning for Hospice is on Thursday 15th September 2016. 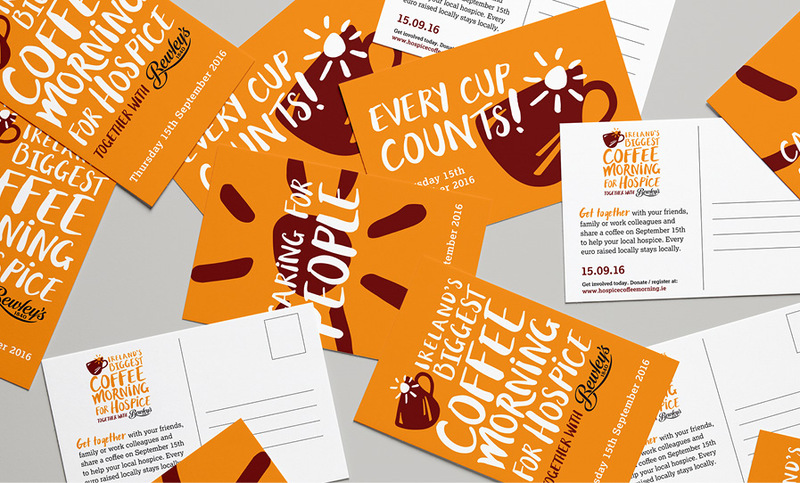 We’re hosting a big coffee morning in the studio and are asking all our agency friends and clients to register on hospicecoffeemorning.ie to host a coffee morning at your workplaces. 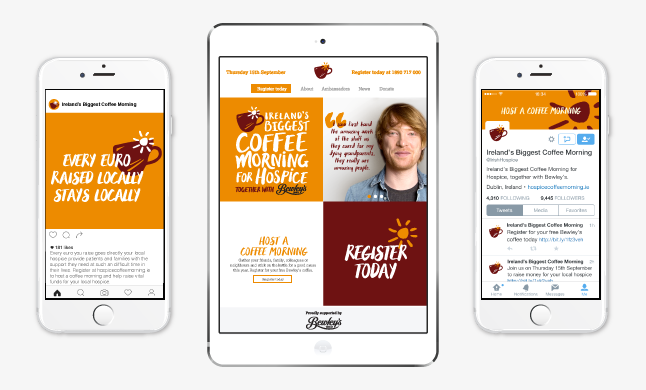 If you can’t host one, please donate online at hospicecoffeemorning.ie where you can select the hospice you want to donate to. 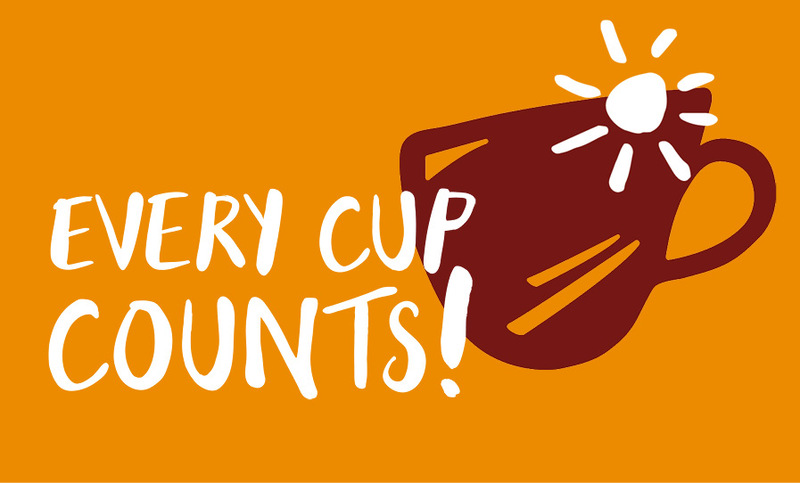 Remember, all money raised locally, stays locally and in this campaign, every cup counts.